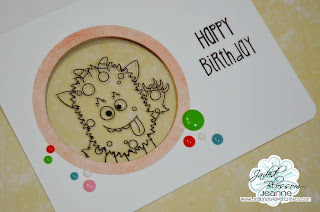 It's Friday, and Jeanne here from Jeanne's Paper Crafts with another super cute project to share with you! Today I tried a new technique that I learned over on Kristina Werner's blog. If you haven't yet, you've got to check out her blog! The technique that I used today can be found right here. And of course, there are some Jaded Blossom stamps that are perfect for this too! To start out, I created a standard A2 sized card out of white cardstock. Then I took some Spellbinders Dies and cut a circle out of the front of the card base. 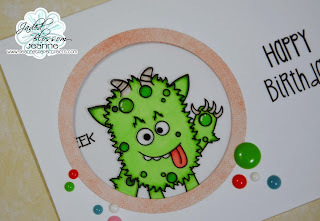 I lined up the circle on the back of the card base and stamped my little monster from the Monster Mash set directly onto the card. I took some PaperTrey Ink Clear cardstock and cut it down to 4 x 5.25 inches to fit inside the card. I lined it up where I wanted it and held it down with some washi tape. I stamped the little monster again directly onto the clear cardstock with StazOn ink. I adhered the clear cardstock to the top of the card base and covered it up with some patterned paper. This just basically hides the adhesive. It's somewhat like a clear overlay to the stamp. 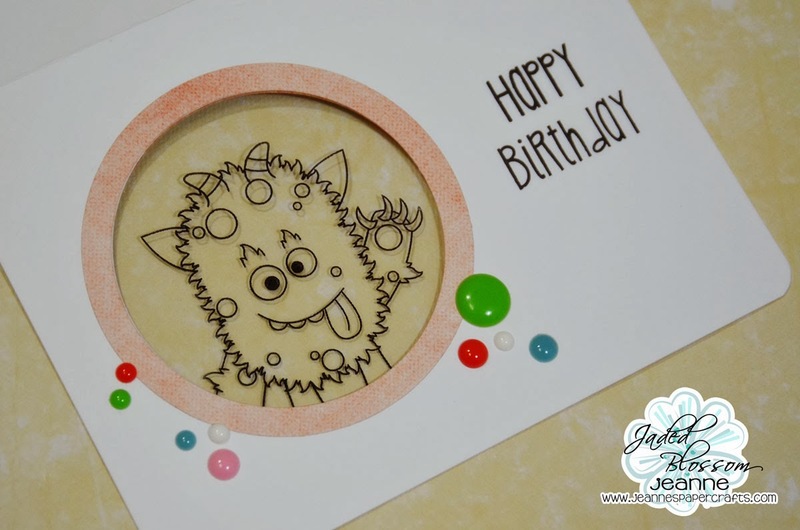 I added the Happy Birthday sentiment from the Picture This stamp set and some enamel dots to the front of the card base. To create the frame around my circle, I just took the circle die and the next largest die in the set, lined them up, and cut them with my Cuttlebug. When you open the card, there is the full stamped and colored image! 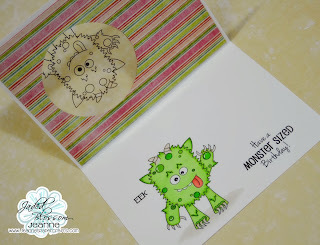 I colored the monster with Copics and then added a couple more stamps to the inside. 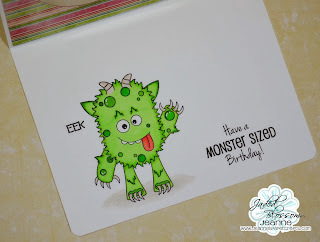 Isn't this little monster adorable?! This is AWESOME!! Such a great card Jeanne!!!! Thanks for sharing and have a GREAT Friday and weekend JB! Fabulous card!! Such a neat idea!! Thanks for sharing!! Absolutely love how you made this and Beautiful Coloring too. The little guy is so cute!! Such a brilliant idea! LOVE that monster too :) Great job, tfs! This is just super cool!! !